The CARs menu can be found on your chapter's homepage. When CARs are received, they are reviewed and awarded points. Remarks need to explain time, money, and hours required to put on an event. These remarks are used to determine whether an event is minor (little planning/effort), average (some planning/effort), or significant (detailed planning/major effort). How do I submit a CAR? 1. Make sure you are logged in first (for guidance on how to login click here) and go to the Chapter Activity Reports section. 4. Select the activity types that apply to your event. Click here for the list of activity types and descriptions of when to use. 5. 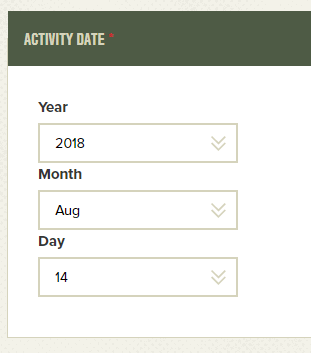 Select the date of the activity using the drop down menu. 6. Fill in the number of people that attended. 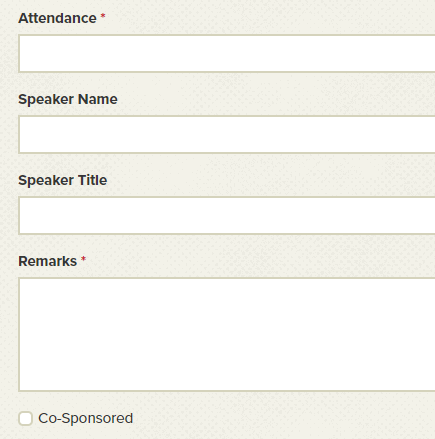 Include the Speaker Name and Title if it applies. For the Remarks, a a minimum fill in the required information for the event and any additional information which will contribute to understanding the scope of the chapter’s involvement. Brevity is key. Just be certain to address each activity selected and explain what was done to justify that selection. Also, indicate of the event was co-sponsored by checking the box. 7. Include any attachments, if necessary. 8. When finished click SAVE ACTIVITY to add it to the database; or SAVE ACTIVITY & ADD MORE to continute with a new event. Select another event and proceed as above. What is a Chapter Activity Report (CAR)? A CAR is a “Chapter Activity Report”. It’s used to report all of the chapter activities. The CAR report is a smart form design that shows fields with activities you can check that apply to your event. CARs are the basis for the Chapter Awards system and inform the AUSA and Army leadership of AUSA support to Soldiers, units, etc. This in turn provides the basis for volunteer recognition. What is the purpose of a CAR? 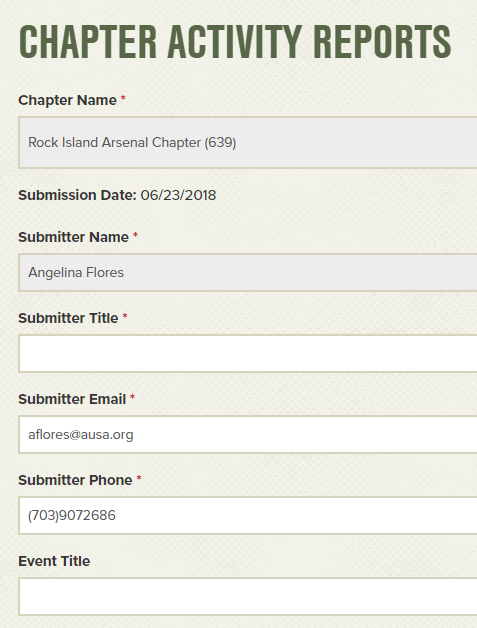 Why should chapters submit CARs? CARs are the primary source of program awards received through the year. Chapters should routinely check the CARs to make sure activities are reported and correctly credited. No matter what a chapter does, if it’s not reported, it cannot be considered. Any meetings and activities by chapter must be submitted on a CAR. This includes newsletters, general membership meetings, EXCOM meetings, etc. What types of events do I submit a CAR for? You can submit a CAR for anything the chapter does but pay special attention to those events which contribute towards the awards program. Awards are NOT based solely on the number of CARs submitted but on the number and quality of the events conducted. The list of event types found in the CAR check box menu is a good indication of the types of events to submit a CAR for. Much of the CAR system is automated. A CAR title may be linked directly to an award so that when it is processed the appropriate credit is given towards that award. A single event may contribute towards several different awards so the CAR system provides a means to submit multiple CARs each linked to a different award. Where are the CARs that I submitted in the old system? The CARs you submitted in the old system are currently not available to view on the new system. Please send an email to [email protected] to request the CARs submitted from the old chapter leader portal. How can I tell which CARs have been approved? There are two status shown on the Approval Status section: 'Pending' have not been reviewed; 'Approved' CAR has been approved. If the remarks do not justify the selection of any checked off activities the activities which were removed from the event will be shown on the Remarks section. How can I see all the CARs my chapters submitted? To view the CARs submitted by your chapter, go to the Chapter Activity Reports section and click on VIEW ALL CARS FOR MY CHAPTER. This section will include all of the CARs submitted by all the chapter officers in your chapter. How do I search for other chapter’s CARs? 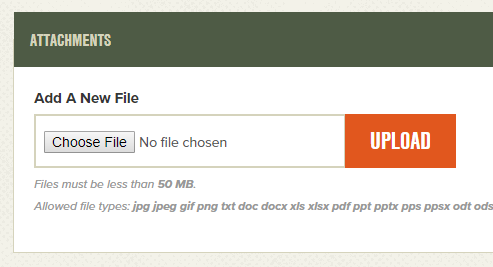 How do I view attachments in an event? Select the event you want to view and go to the 'Attachments:' portion of the page. Click on the file's name to view the attachment. Can I export the CARs my chapter has submitted? Please contact Angelina at [email protected] for a list of CARs submitted by your chapter.